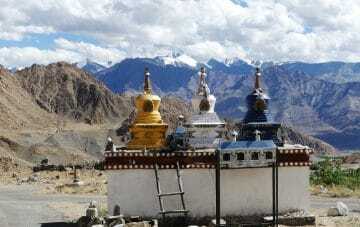 Ladakh, also known as “Little Tibet ” is an insider’s tip for trekking enthusiasts and lovers of original culture. 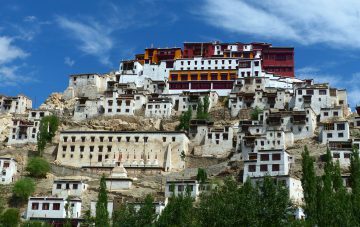 Barren mountain landscapes, snowcapped mountain peaks, small mountain villages, green oases, ancient fortresses, monasteries and Tibetan Buddhist culture characterize this small piece of earth. This trip is full of highlights and shows you the local culture, tradition, and Buddhism in its various forms up close. You will visit some excellent attractions such as the Shey, Thiksay, Lamayuru, and Alchi monasteries. In addition, you can admire the beautiful oasis-like deserts in the Nubra valley and cross the world’s highest highway on Khardungla at 5,260m. Finally, visit the Taj Mahal and return home with unforgettable impressions. During this trekking & cultural trip you will quickly become familiar with the unique dry mountain landscapes and green valleys as well as the oasis-like deserts of Sham Valley. It is a fascinating introduction to gain about the land of lamas and the unique mountains of Ladakh. The tour goes through the Indus valley and the ancient kingdom of Sham. This is one of the most famous walks in the very popular region of Hemis National Park that Ladakh has to offer. 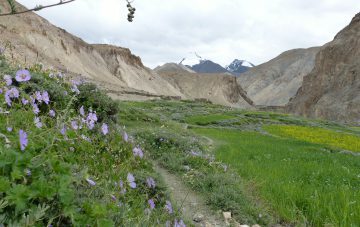 With views of several 6,000 m mountains including Stok Kangri, you hike through green and colourful valleys. Along the way you are surrounded by barren mountain landscapes and wild rivers. You will cross the high passes Ganda La (4,980m) and Kongmaru La (5,280m). 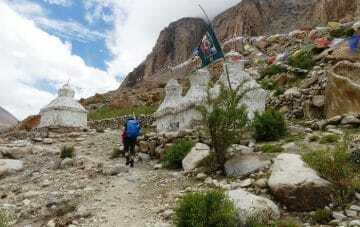 On this demanding tour, upon leaving the Nubra valley you move westwards and cross the 5,400 m high Lasermo La (pass). The tour takes you past impressive gorges, desert ridges, barley growing areas and meadows with colourful flowers that accompany you on the way to the picturesque monastery in the village of Phyang. Nubra valley is rich in Tibetan culture with well-preserved monasteries such as Diskit and Samstaling as well as regional architecture.